Is it too early to be talking about New Year’s? I am already thinking about it and have my evening at home planned out. I will spend it looking back over the past year while I think about my plan for the upcoming one. It’s a low-key and relaxing way to transition to the next year with intention. Why do we think that as adults we need to be scheduled every minute? Downtime is important to restore your spirit and mind. I’ve written before about this and really have made a conscious effort to make more time to focus on myself. 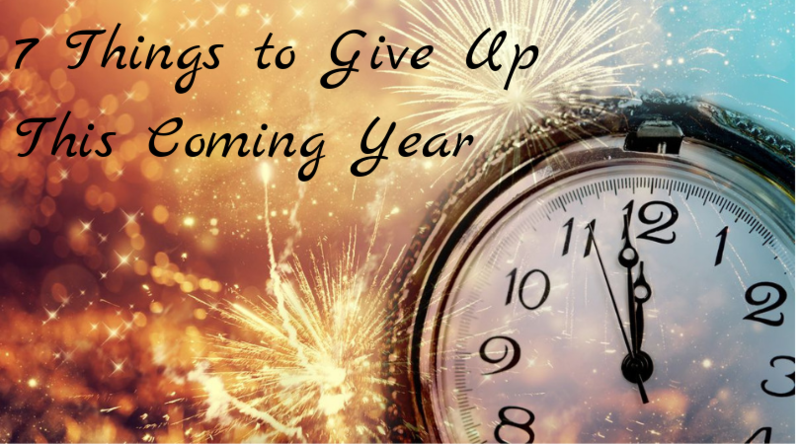 Resolve to look at your planner and eliminate something for next year. Did something happen in the past that you need to stop thinking about? I have a tradition of buying an inexpensive calendar at the beginning of the year and recording the really bad stuff. This sounds negative, but as I write things down, I am able to let them go. I note things like deaths of friends or family, natural disasters, or any other major things that affected me personally. I also invite friends to tell me dates to add to it. At midnight I toss it in my firepit and let it all go up in smoke. Of course, change is scary, as humans, we take comfort in the familiar. But imagine a time you made a change and it turned out well? For me, the scariest thing is changing jobs. I hate quitting and I hate being the new person. However, every time I have taken a deep breath and done it, I have ended up in much better positions. Looking back at some of the jobs I was afraid to quit, I can’t imagine staying at them now. I remember a line from a song that has resonated with me over the years, “You see, ya can’t please everyone, so ya got to please yourself.” I find it so true that when I put all my effort into pleasing others, I find myself unhappy. I’m not saying to be selfish, just don’t live your life trying to fulfill other people’s expectations. I adore having something to look forward to, whether it be a trip, an anniversary, or just a change of seasons. But if you are always telling yourself that things will be better when you go on that trip, hit that milestone, or summer starts, you will never be happy with yourself now. Find something to love today and see if it makes you happier. I do my fair share of both of these, but less than I have in the past. My spending is more intentional now; I focus on needs rather than wants. And I am always looking for ways to save time! After all, both money and time are gone once you have spent them. One of the easiest ways to save both is to take a few minutes to sign up with BillCutterz. Our team of Savings Experts will spend their time making sure you aren’t wasting money on your bills, so you can spend your time on something more fulfilling!